Sarah’s garden is beautiful! The simple subject of “Peaceful Garden” was complicated to paint. More detail? Less detail? …and so it went. 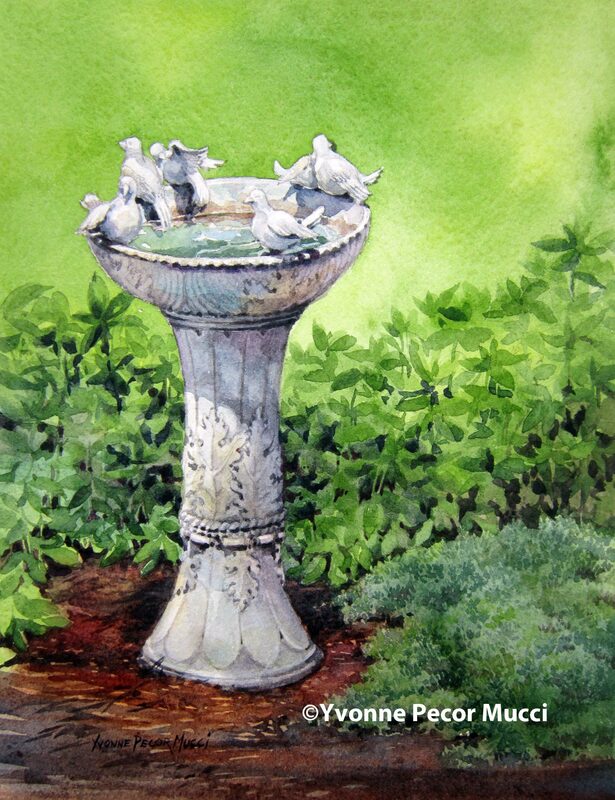 The drawing had to be right and the background simplified because there was so much detail on the birdbath. 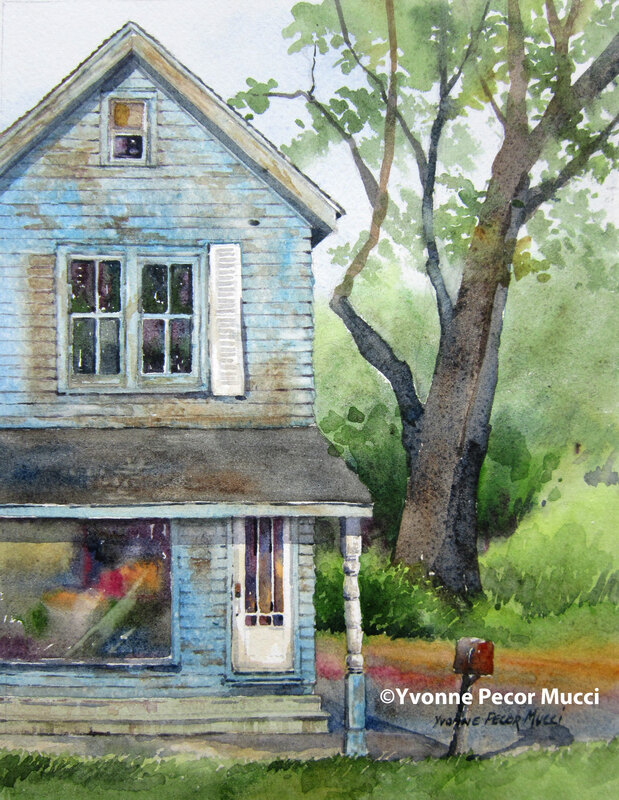 I love capturing the light and pushing the color in a painting, it brings you right back to that place and time! Which was very peaceful. 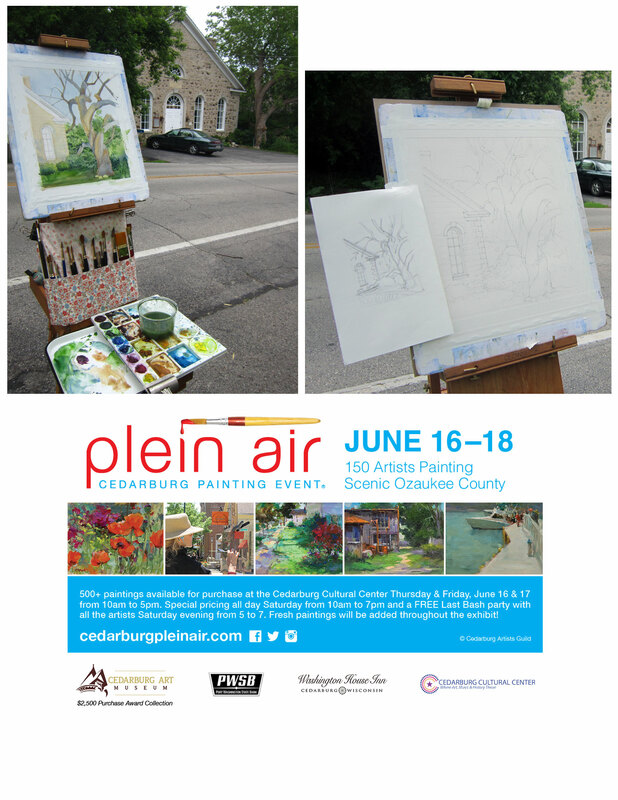 This was Cedarburg Plein Air’s 16th year. Happy to have been part of it. 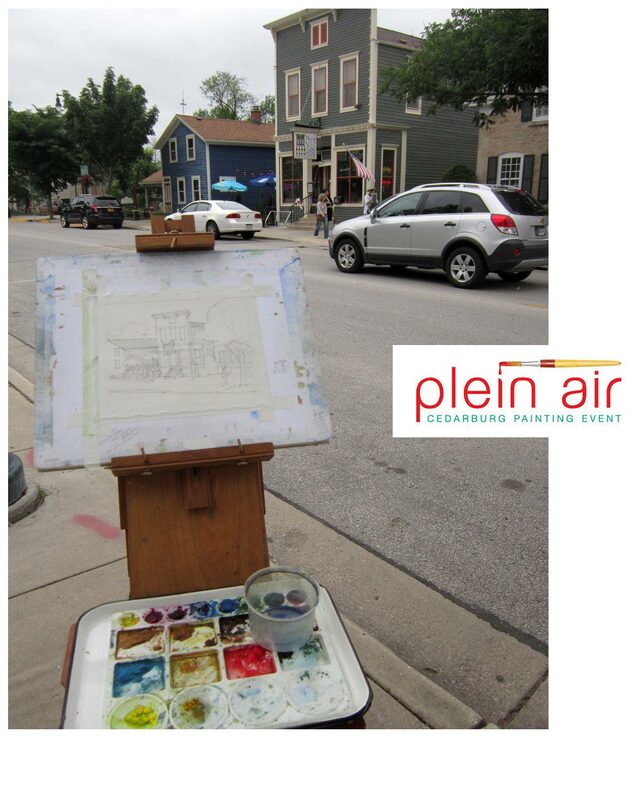 “Locally Raised” watercolor was painted for Cedarburg Plein Air gems which was the last day of the event. Lots of people were out and about, enjoying the town of Cedarburg, WI. In the early 1900’s, the owner of the tavern asked the city for permission to add a second floor onto the existing building. After the city denied his request, he raised the building up on “stilts” and built a first floor underneath. Hence the name Stilt House. They have great food! A retired hayrake sits rusting in front of a well preserved blue-gray barn in the Hamilton Historic District. This glade leading up to the barn glowed in the late afternoon sun. It was magical! Best part was being able to enjoy the company of friends while I finished painting. 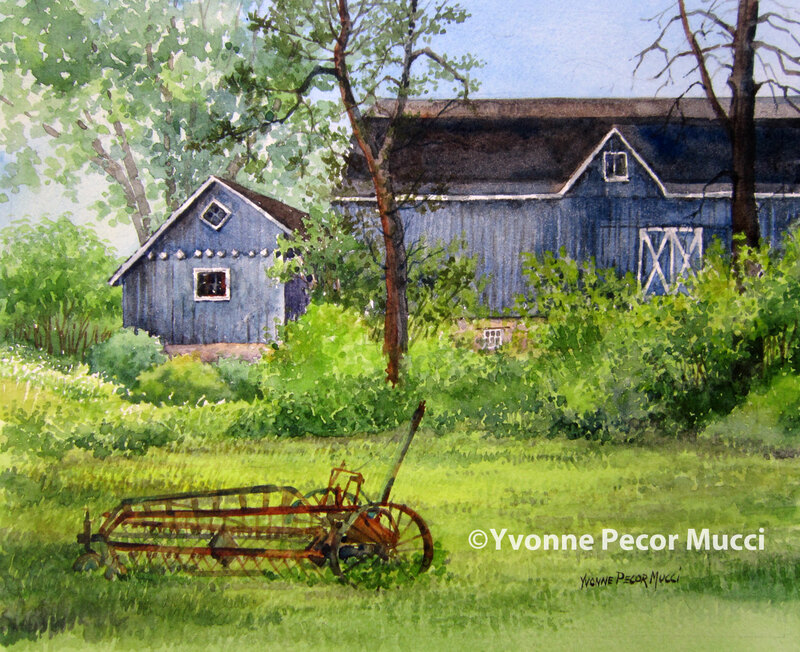 “Hayrake” was painted during the Cedarburg Plein Air competition. Fabulous event, even better people. Thank you to Cecily and John who give me free reign to paint on their property. 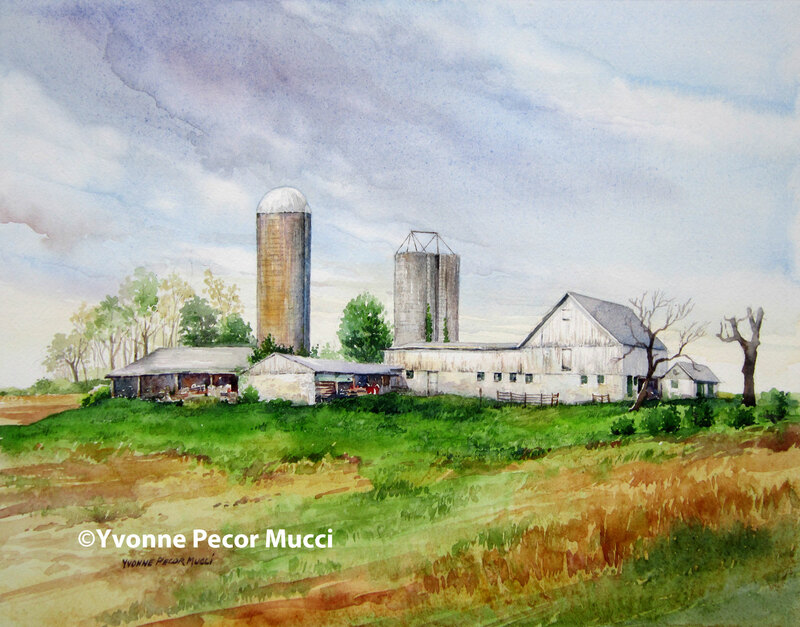 “White Barn” watercolor was painted during the Chestertown RiverArts “Paint The Town” plein air competition. Rich with farms, the area is not lacking for subject matter. Everything about this barn drew me in. Sitting on a little hill, multiple silos, wide open landscape, and the white washed wood with green trim, how could I resist! 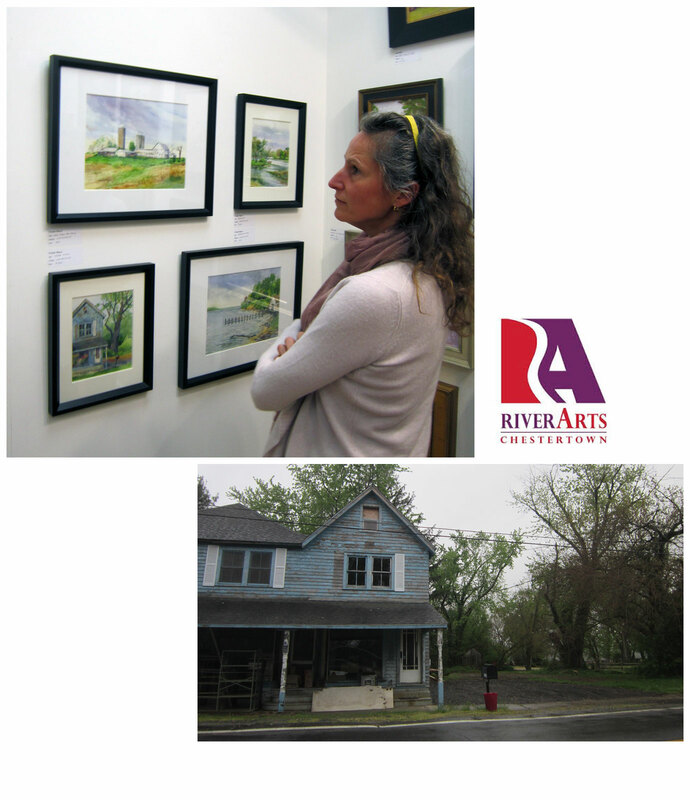 After a full day of painting, RiverArts hosted the artists to a banquet of homemade dishes. YUM! Nice to break bread with fellow artists and hear stories of the unforgiving weather everyone experienced. 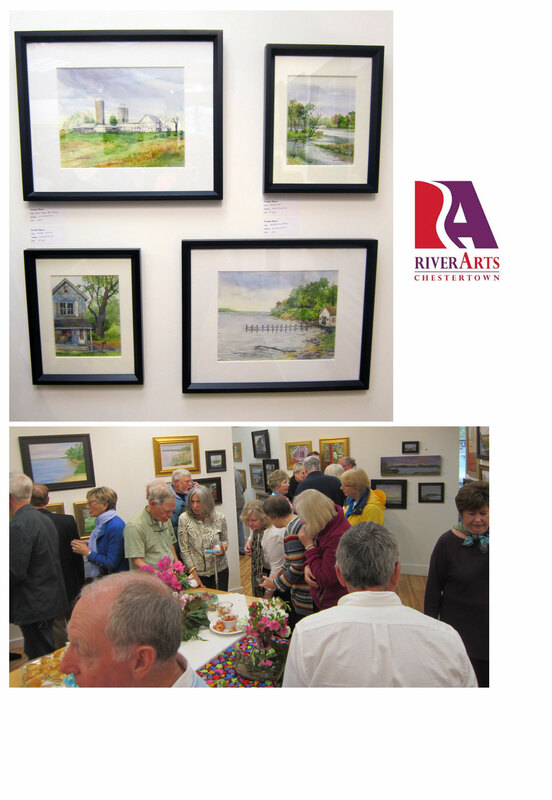 Thank you to everyone at RiverArts who made sure we were all taken care of and provided a well attended artist reception. 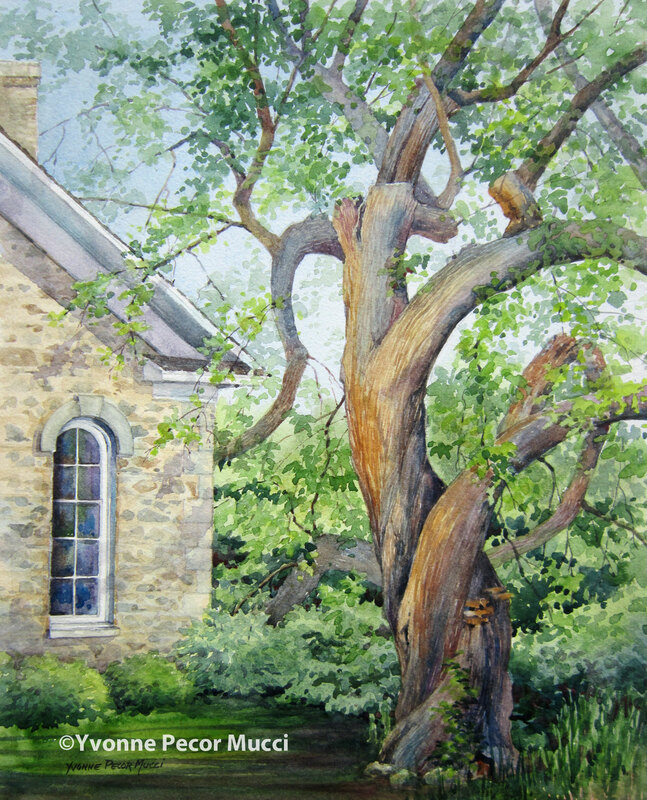 When it is full summer and you’re painting plein air, sometimes you want a subject without a lot of green. That’s one of the reasons I chose to paint “Faded Blues”. Loved the old wood and missing shutter on this building that was being restored. It used to be a general store on Still Pond Road. 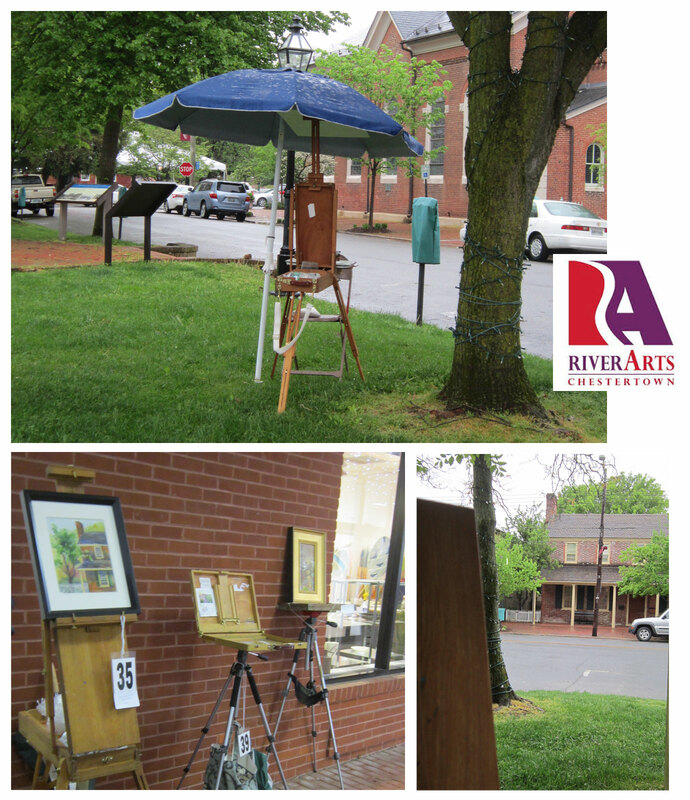 Such a rainy week for the Chestertown RiverArts “Paint The Town” plein air competition, but it did not stop any of the artists from producing quality work. The misting actually helped me apply texture on the blue clapboard. 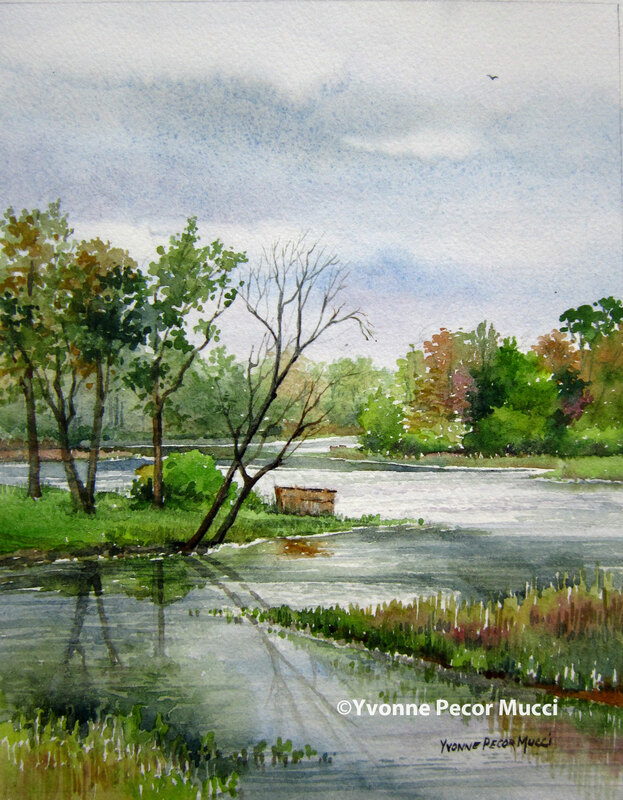 “Creekside” watercolor was painted on a gorgeous day of plein air painting at the end of Rileys Mill Road in Chestertown, MD. 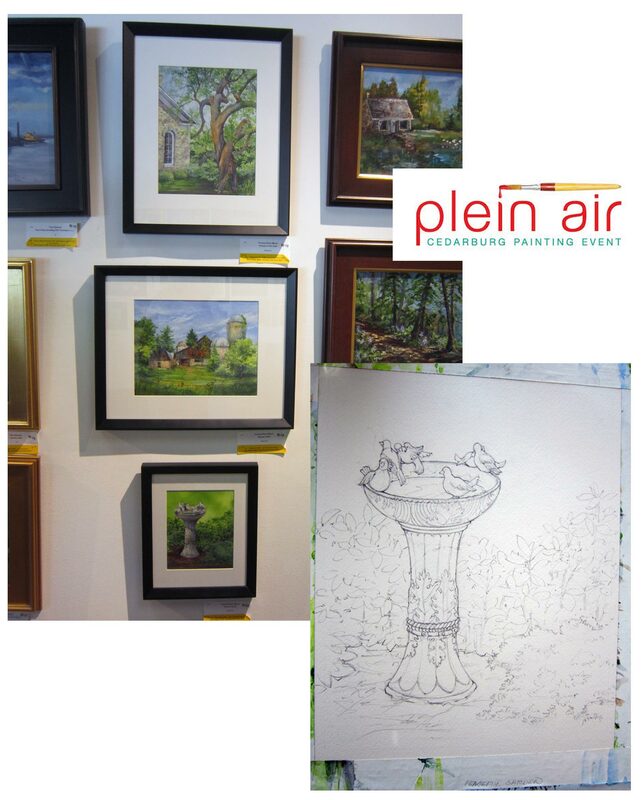 Sunshine peaked in and out of the clouds all day at RiverArts 7th Annual “Paint The Town” plein air competition. I loved the duck blind sitting on the edge of the creek and the silver reflections of sky. 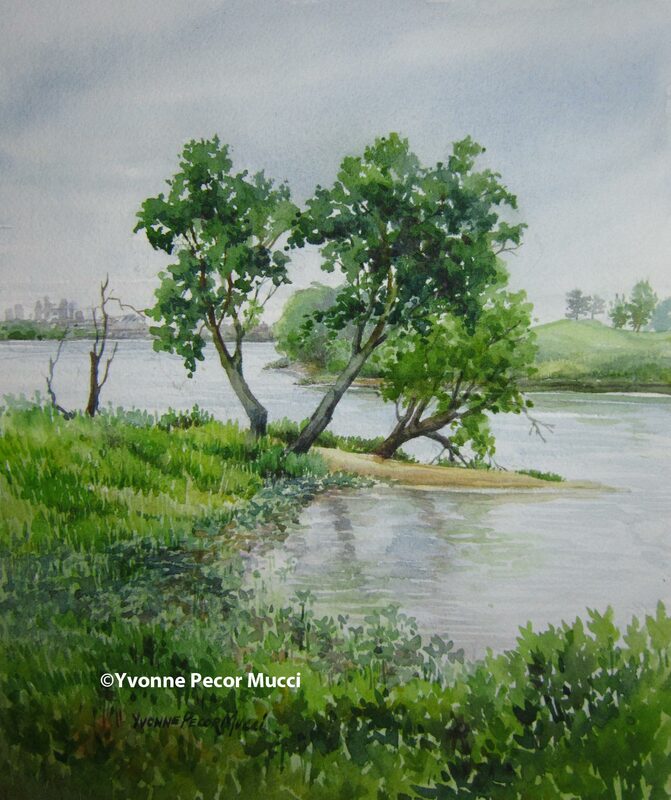 So how does a watercolor artist paint in the rain? By bringing your big beach umbrella and crossing your fingers! My quick paint experiences are never great, full of stress, and limited to two hours including framing. But I do them to challenge myself. Pushing to make quick decisions on color and composition. 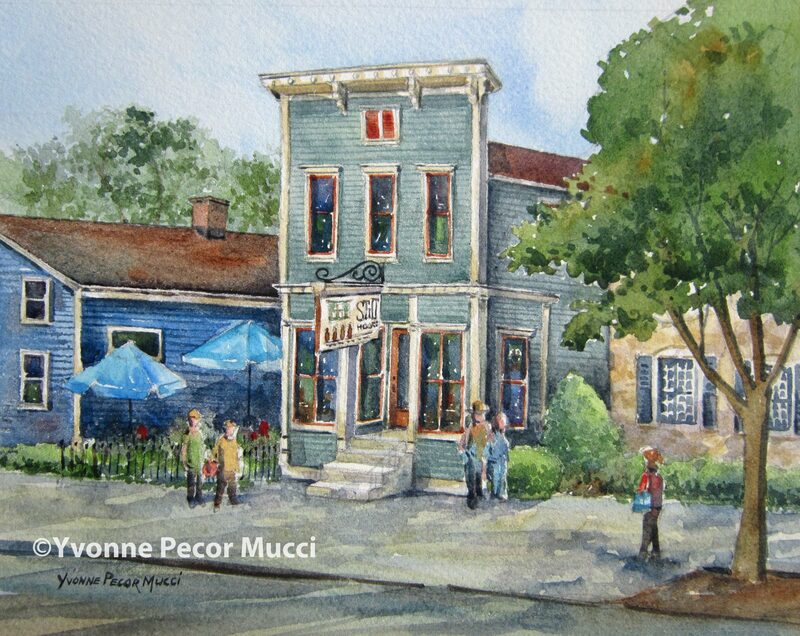 “White Swan Tavern” was painted for the RiverArts 7th Annual “Paint The Town” plein air competition in Chestertown, MD. 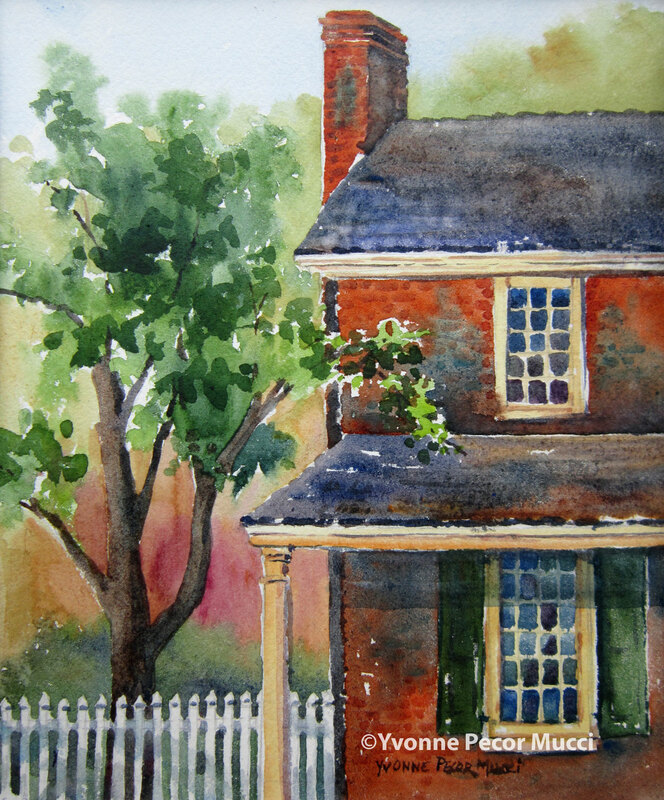 The 18th century Bed and Breakfast is located near Washington College in the center of Chestertown historic district. 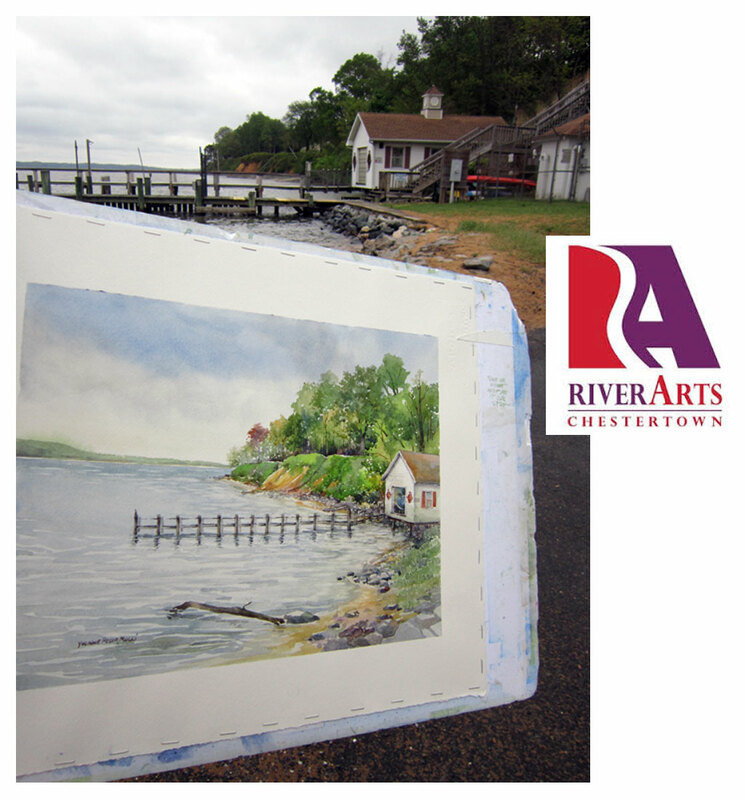 Had a great time painting at the RiverArts 7th Annual “Paint The Town” in Chestertown, MD. 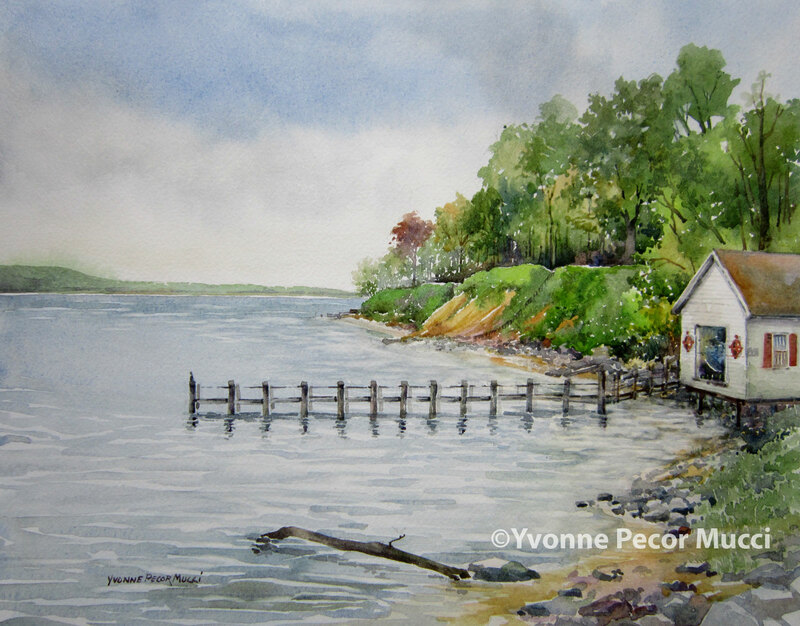 We could paint anywhere in picturesque Kent County. Betterton Beach was beautiful in the pouring rain! I simplified the dock a bit to give the overall painting a peaceful feel. 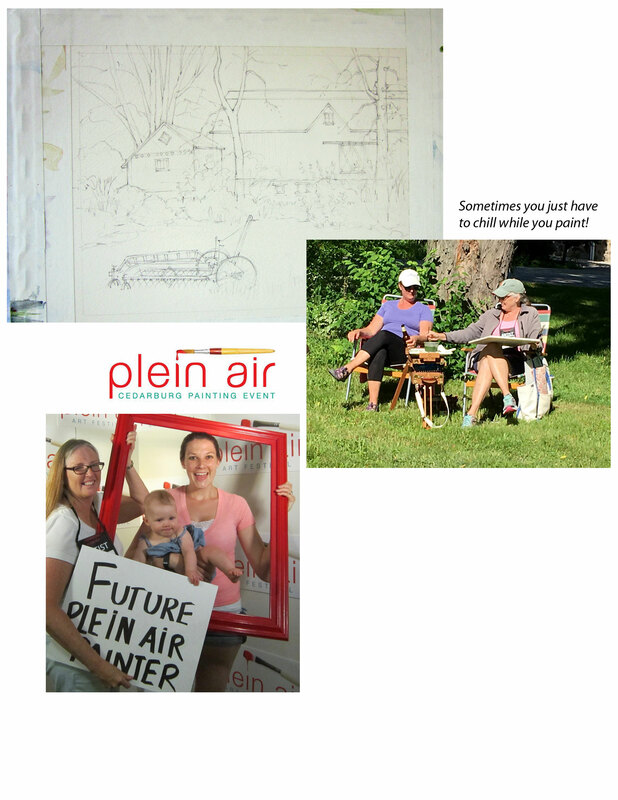 Such a fun plein air competition, I’ll definitely be back next year to paint the town! Special thanks goes out to Cindy for her fabulous hospitality. My daughter planted an apple tree from a seed many years ago. Two of these apples were from the tree I thought would never grow. I set up this still life on my picnic table while the late afternoon sun was casting strong shadows. 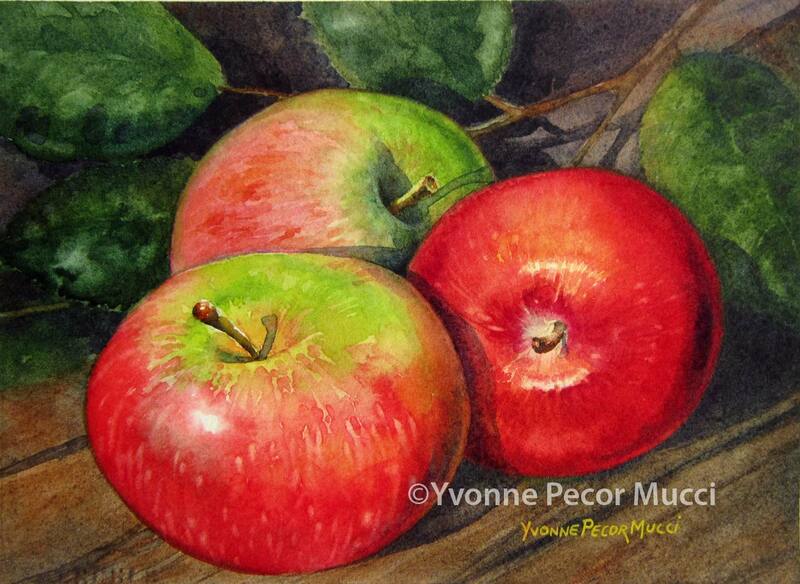 The color was so rich looking, it made me want to take a bite of those apples. They didn’t last long! Below is a painting progression. Sycamore trees are messy with their peeling bark and seed pods, but at the same time, that’s what makes them beautiful! This fall scene could be found anywhere, but it is right down the road in southern New Jersey. 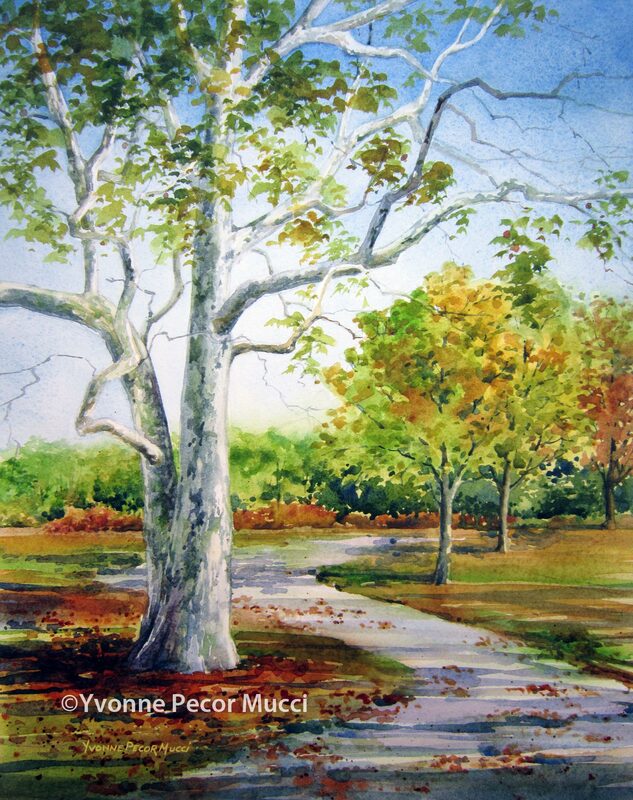 I wanted to keep this painting fairly loose and play up the fall leaves along with the white tree limbs against the blue sky. Frame size is 16 x 20, mat opening is 11.5 x 15.5. It is painted on 140 pound Arches cold press paper.